Timely completion of applications and college acceptance can help parents and students plan finances for the coming years. But applying for college can be stressful. And you (or your child's) senior year of high school should be fun. How do you accomplish both (completing applications and enjoying yourself)? While I can't relieve all of the angst associated with the college admissions process, I have discovered a few secrets that may lighten the load and help make the last year before college more enjoyable. Putting together a college application resume allowed my sons to compile the information needed to respond to various prompts associated with the application process. They didn't submit resumes to any admissions offices. However, this document was useful for the following purposes: 1) teacher recommendations; 2) college application forms; 3) college application essays; and 4) scholarship applications including essays. School Activities: details of participation in sports, music, clubs, etc. to include special roles or accomplishments, if any, such as team captain or club treasurer, state or national ranking in competitions, etc. Community Activities: community-based activities such as scouting, church, mission trips, etc. along with leadership roles, unique accomplishments, etc. Generally, there's a narrow window of time to apply, and high school students have a finite amount of time. So, early in the college selection and application process, they focused on narrowing their choices. Don't think that technology will make applying to colleges super easy. For example, The Common Application can make applying to multiple colleges easier than otherwise but not necessarily easy overall. Even if all of my kids' choices required one common application, they'd still need to a) pay application fees separately and b) most likely write essays for different prompts. Plus, one or two colleges tend to have a quirky requirement involving manually submitting certain information. The fewer colleges and universities on the list, the lighter the college application workload will be. After creating a short list of targeted colleges and universities, they examined requirements for letters of recommendation. Typically, my kids needed one or more teacher recommendation. Sometimes, they needed recommendations from their guidance counselors or adults in the community.They identified two or three teachers and one or two other adults who knew them reasonably well. I encouraged them not to be greedy or overbearing but to consider requesting more letters than the minimum because it's possible that one person may not be able to complete a recommendation within the timeframe. Plus, more than the minimum could give admissions offices a more complete view of their personalities and strengths. They asked for the letters of recommendation early, like in August during the first week of school or as soon as teachers returned for school. They gave recommenders as much information as possible: passing along information about themselves via the resumes or other means (see these talking points and more from College Board), the desired format of the letter (e.g., electronic submission or sealed envelope), and deadline. My sons found out when college applications opened and determined the open dates of early applications. They could complete the applications early and possibly apply early even when they weren't asking to be considered for early actions or early decisions. In some cases, admissions are made on a rolling basis so earlier applications may have a better chance of earning an acceptance. Institution-based scholarships often have deadlines that are in sync with early-decision/early-action timeframes, so the opportunity for scholarship monies may be improved. (An exception to this general rule is the student who may perform significantly better on a SAT or ACT retesting session in November or dramatically improve his or her class rank after the close of the fall semester; for more on the pros and cons of applying early, see this article on the College Board website.) After looking at the opening and closing dates of applications, they decided which ones to complete and determined what order to complete them in. As soon as possible after the applications are opened, they reviewed the essay prompts. They put together the first draft of their essay(s) within a timeframe that allows them to 1) get feedback on the essay from a trusted adult; 2) re-read and edit the essay for content; 3) make any corrections in regard to spelling and grammar. They wrote the essays in their own voices, giving stories and illustrations as much of their personalities as possible. When racking their brains to think of life experiences that involve leadership, tribulation, or whatever the essay prompts require, they looked over their college application resumes to find inspiration. Also they asked friends and family members for ideas as other people had good insights into what made them, my kids, unique and noteworthy. Peterson's, a resource on colleges and universities, offers these tips (and more): be concise; don't use slang; vary sentences; and use transitions. Finally, before submitting essays and other documentation, they copied and pasted content to a Word document for safekeeping. Later, they could refer to the essays for other writings. While they didn't use an essay prepared for one college to apply for another college, they could review completed essays before starting another one to get content ideas and identify areas of improvement. Our family learned that we couldn't control the outcome of the college admissions process. 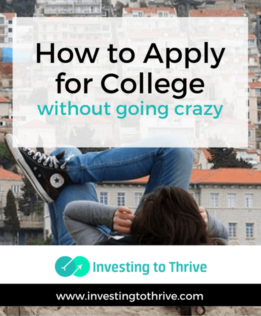 But we did discover that our kids could make the process easier on themselves by narrowing the list of prospective colleges and universities, and getting an early start rather than waiting until deadlines loom.